Meet Hunter, a roughly 4 year old pit bull who spent most of his life living on the streets with a homeless owner. Hunter and his owner would sleep outside in a sleeping bag on a nightly basis. In April of 2017, that owner was sent to prison and Hunter was not only homeless, but ownerless. Hunter was put up for adoption and was noticed by Kelly, a sister of a Doctor Multimedia employee. Hunter’s story particularly touched Kelly as both her and her husband are in law enforcement. Kelly and her husband adopted Hunter and brought him home to join the dog they already had. The first few months at Hunter’s new home were a dream come true. Hunter had a roof over his head, a friend to spend the day with, and multiple acres to safely roam. Kelly and her husband’s lives changed too, as they found out they were expecting their first child in 2018. In September, Kelly noticed Hunter started limping. 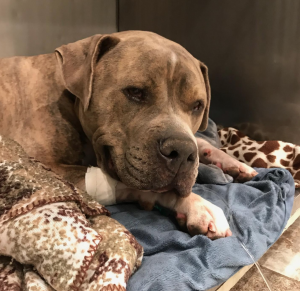 As the limp got worse, she took Hunter to see their local veterinarian, who thought it might be a strained muscle and said to bring Hunter back in a week. 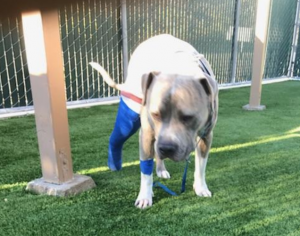 The limp continued to get worse and on the return visit, x-rays revealed that Hunter had torn both ACLs in both his back legs. Surgery was the only option to save Hunter. 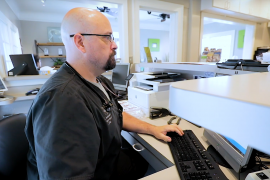 Looking for a trusted surgeon, Kelly and her family turned to Doctor Multimedia client Mohnacky Animal Hospital. Chief of Surgery Dr. Zoran Djordjevich (known as “Dr. George”) met with Kelly to review Hunter’s case. 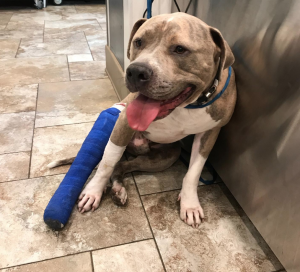 Hunter needed to have both ACLs repaired, but the surgeries had to take place one at a time in order for him to recover properly. The cost of each surgery was $5700, bringing the total for surgery to over $11,000. With a baby on the way, this cost was simply not feasible for Kelly and her family. They began confronting the sad possibility of having to put down the dog they had just rescued from a life of homelessness. 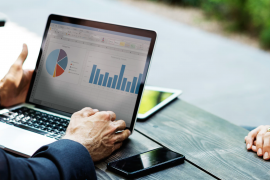 When AJ Thakore, CEO of Doctor Multimedia, heard about Hunter’s situation, he knew he had to help. 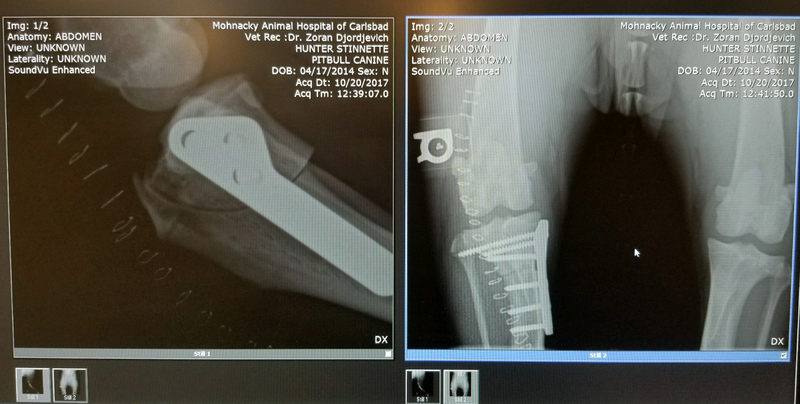 Without any thought, AJ and Doctor Multimedia donated the cost of both surgeries to Mohnacky Animal Hospital to repair Hunter’s ACLs. The first surgery took place in mid October and Hunter has been recovering well. Hunter has been recuperating by staying in his crate and on leash. Not knowing his own strength, Hunter tries to be more active than he should, and actually shows no signs of limping. The final follow up occurs this Friday, when Hunter may receive the green light to resume normal activity. Then, preparations can begin for the second procedure, which will have Hunter in the best shape of his life. The last nine months have been a whirlwind and a roller coaster for Hunter, Kelly, and their entire family. But with Hunter looking good and her first child due in March, Kelly and her family have never been happier. At Doctor Multimedia, new pictures of Hunter playing regularly make our day. We wish Hunter good luck this Friday as he gets cleared to be his big, lovable, clumsy self once again!